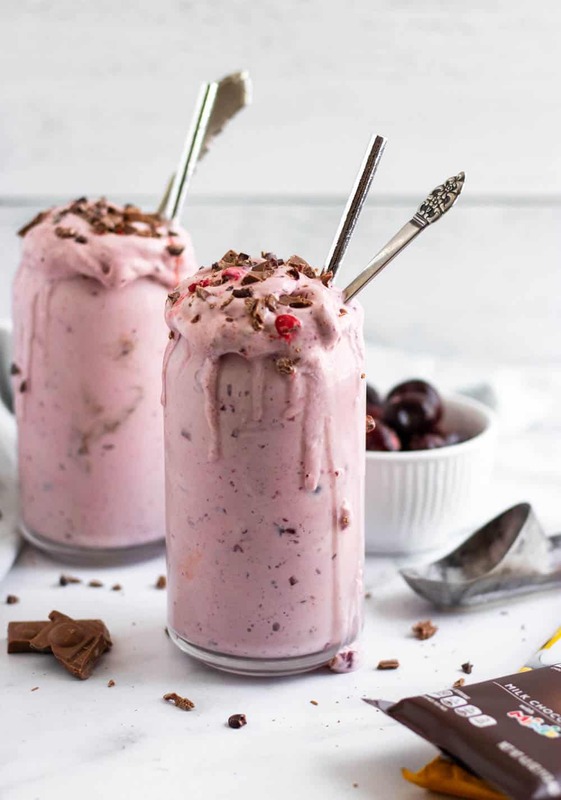 Dark sweet cherries, new M&M’S® Milk Chocolate Bars and all the goodness in this Cherry Chocolate milkshake that you can eat with a spoon or a straw–you choose! 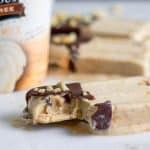 Simple treat recipe everyone will love! Fact: on any given day, there are at least 3 separate kinds of M&M’S® candies in our household. Currently, we have the Dark Chocolate Peanut, Holiday Mint and some Valentine’s Day regular milk chocolate M&M’S® candies. I would like to say that these new M&M’S® Chocolate Bars are still hangin around but unfortunately, we are in major need of a restock of these treats—and very soon! I am extremely selective about partnerships here on the blog, as I have mentioned numerous times, and I feel strongly about only partnering up with brands we have in our home and consume regularly. 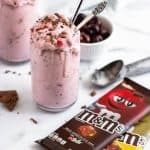 Well, clearly, the opportunity to create something amazing with the new M&M’S® Chocolate Bar was a no brainer, and I am so thrilled to bring you this delicious Cherry Chocolate Milkshake today! Try new M&M’S® Chocolate Bars, available at your local Walgreens, today. 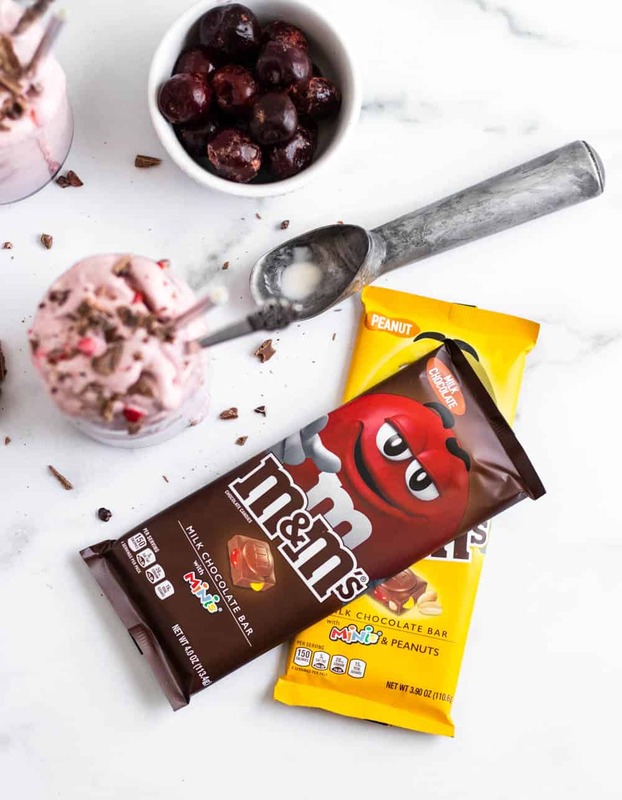 The marriage of M&MS® candies and a chocolate bar has been a long time coming, and it is a treat that is so perfect on its own. 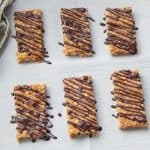 If you just got the candy bar and skipped this recipe entirely, I would not blame you. 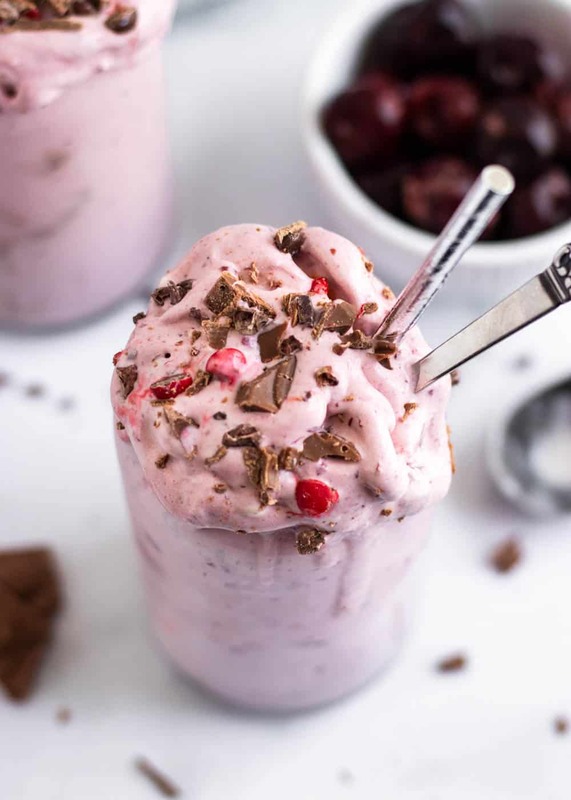 HOWEVER, if you are like me and believe that all treats can always be taken up a notch, then please move forward, after sampling a bar or two, and try this simple Cherry Chocolate Milkshake. 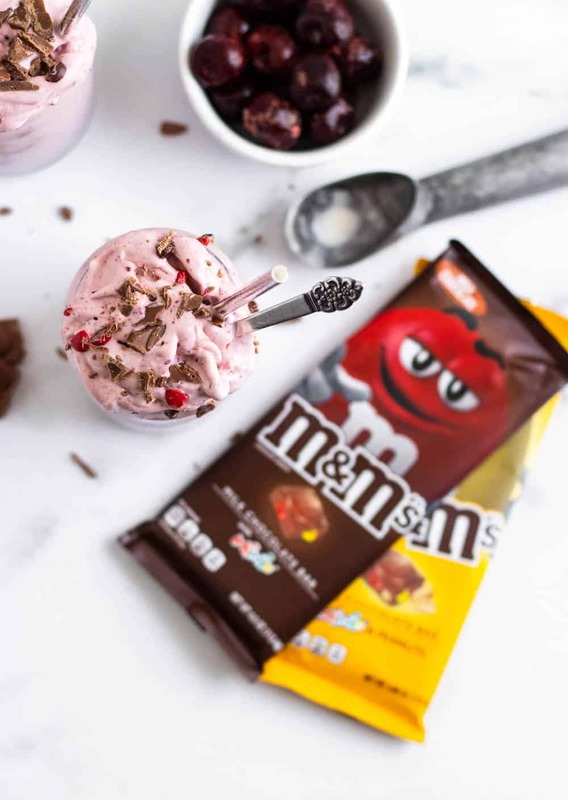 Rich and full of cherries, big chunks of M&MS® Chocolate Bars, and creamy vanilla ice cream, this treat is certainly going to be a new fave for everyone in the house. 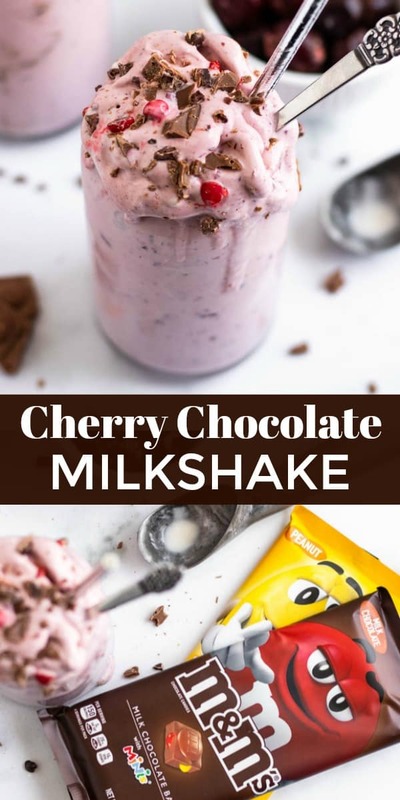 This is essentially a milkshake that is too thick and too full of chunks to drink from a straw. That’s right, you are gonna need a spoon and an appetite for this one. 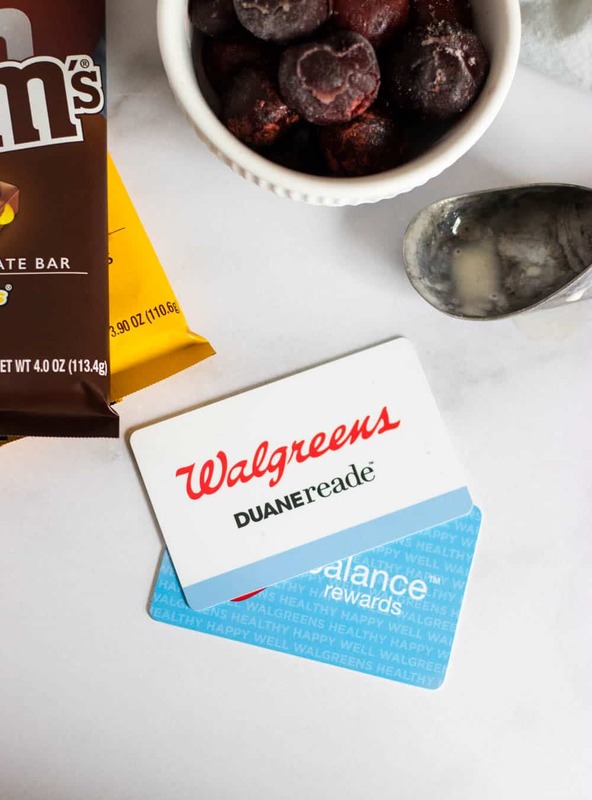 The beauty of these new bars is that you can grab them at your nearest Walgreens and get in and out in a flash. Sam and I like to walk up to our neighborhood store and grab odds and ends that we may need. Of course, we couldn’t last week with the Polar Vortex, but coming up this week with the spring-like weather, we will be back to it! We are really lucky to have a Walgreens so close to the house. Makes for a nice walk with a purpose—gotta get things done! And I can have Anthony grab things quickly on the way home from work. I am the QUEEN of forgetting things I need for recipes for dinner. Oops. Well, friends, it’s almost Valentine’s Day, and I am certain your valentine would be thrilled with this beautiful pink treat. So, what are you waiting for? Grab the ingredients and get to it! In a high powered blender, add milk, vanilla and then scoop ice cream and press down. Blend on high until smooth. Add in cherries and M&M'S® and pulse several times until mixed in. Pour into glasses and enjoy! 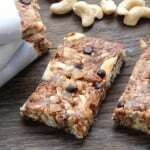 Add extra chopped M&M'S bar on top as well for even more goodness!